If the reverse – bias applied to a p – n junction is increased, a point will reach when the junction breaks down and reverse current rises sharply to a value limited only by the external resistance connected in series. 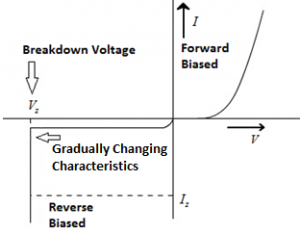 This specific value of the reverse bias voltage is called breakdown voltage (V). What is an Avalanche Breakdown? The mechanism of avalanche breakdown occurs because of the reverse saturation current. The P-type and N-type material together forms the PN-junction. The depletion region develops at the junction where the P and N-type material contact. The avalanche breakdown is observed in the Zener Diodes having Vz greater than 8V. In the reverse biased condition, the conduction will take place only due to the minority carriers. As we increase the reverse voltage applied to the Zener diode, these minority carriers tend to accelerated. Therefore, the kinetic energy associated with them increases. While travelling, these accelerated minority carriers will collide with the stationary atoms and impact some of the kinetic energy to the valence electron present in the covalent bonds. Due to this additionally acquired energy, these valence electrons will break their covalent bonds and jump into the conduction bond to become free conduction. Now these newly generated free electrons will get accelerated. They will knock out some more valence electrons by means of collision. This phenomenon is called as carrier multiplication.